I’ve made it my goal to restore Sabahan.com to its former glory and even more (if there’s such a thing lol). What I have to start with now is a pretty good and relatable domain name. At least from where I come from it’s a familiar one. If you don’t know what it means, a Sabahan is anyone who is from Sabah. Sabah is one of the states in Malaysia, located in the island of Borneo. Adjectively, it means anything pertaining to Sabah or its people; i.e. the “Sabahan tribesmen”. I realised there are non-Malaysian who are reading my blog hence the explanation :). OK enough with the word definition lesson already. Another big advantage that I have is I do not have to start from scratch! Many of the time-consuming groundwork has already been put in place. Sabahan.com is already online, happily running WordPress. Just some redesign and the addition of new features to keep abreast of the current blogging trend are in order. Sabahan.com had a pretty interesting previous life. With a decent amount of traffic and quite a number of loyal followers, it was perhaps one of the best personal blogs about Internet Marketing and how to make money online in Malaysia (well, I could be bias because it’s my blog lol). Anyway, what made Sabahan.com different from the other blogs in the same niche was the content was based on my own experience. Not that other bloggers didn’t share their experience. I just tend to share things that other Malaysian bloggers weren’t writing. For instance, how I paid another blogger USD400 to get Sabahan.com reviewed and then I shared my findings… among many other interesting blog posts. My posts were not just a collection of how to make money articles that you can find anywhere on the Internet. Unfortunately, as you may know, I stopped updating Sabahan.com for quite some time. This post is like a post-mortem of what went wrong and what could be done better. This post will reveal the pertinent issues I need to tackle with and what my plans are for the near future. I am not talking about using a new theme but a complete overhaul of the site structure. At the time of this writing, Sabahan.com appears to look like any other blogs. The home page simply features a list of my latest blog posts. That is an outdated way of presenting my content. Increasingly, the common trend is to have a portal-like static-homepage which communicates what your site is about and who it is for. It has to emphasis the benefits to your new visitors. The homepage may also include your recent posts among other offerings. 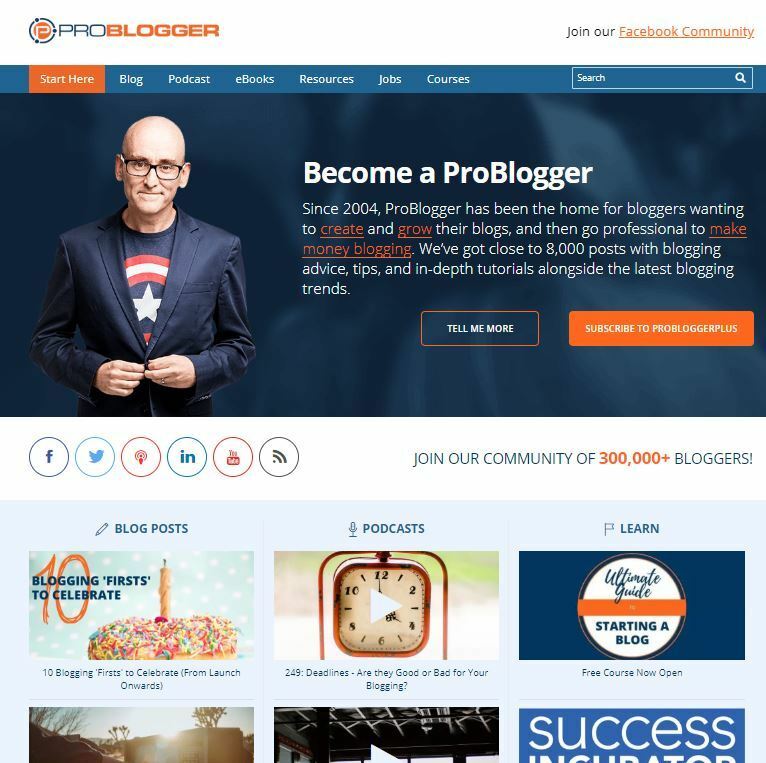 Take ProBlogger.com as an example to see what I have in mind. But I won’t go as far as displaying my picture upfront. I haven’t really reached such level of authority to use my face to market my brand. So in a couple of days, you’ll see Sabahan.com morph into something similar. The homepage is a great place to convert visitors to whatever goals that I set for Sabahan.com. For any serious bloggers in 2018, there’s no excuse for not creating social media profiles. Your Facebook, Twitter and Google+ pages are important for SEO as well as traffic building purposes. Your social media profiles can add value to your brand by adding content that won’t appear on your blog itself. Having an actual Twitter for your blog also allows you to get to know the big players in your niche and build a rapport with them. Google may look to social media as a signal of an article’s authority and relevance (this is not new but, but there’s no excuse for any serious bloggers not to start now). The best way to get shares is by writing the best quality content you can come up with and create a loyal following. If they like your content, they will promote you for free. Admittedly, I haven’t completely created my social media accounts yet but they will be done once I get this post published! At first glance, only a handful of Malaysian blogs that existed before 2010 are still here today in 2018. To be fair, it takes an incredible amount of motivation for someone to continue writing for that long. Personally for me, it was the Return On Investment (ROI). My original intention for Sabahan.com was rather a noble one (if you can say that lol). Unfortunately, later I found out one need more than that. I wanted to share all my online money making adventures for free and hope they could benefit others. While that had been successful in getting comments, engagements and subscribers, it didn’t translate into financial returns. I run many other online businesses and if one venture is taking too much of my time but generate little income, it won’t be sustainable for long. Being a self-employed, I need money to pay the bills too! So moving forward, I’ll start working on longer content that solves problems and provides value to people. In return, I hope to get more engagement and subscribers, which hopefully will translate into more income for Sabahan.com. That does not mean I will fill this blog with more affiliate links, advertising or sponsored posts. Instead, I will still focus on writing useful content that make Sabahan.com stand out and be memorable. Having to stay on top of the changing SEO trends that happens every year takes some effort. To tell you the truth, I have not done many research into this (yet) but I’m convince, getting organic traffic in 2018 is not as easy as it used to be. That said, I believe many of the SEO optimisation techniques to help one stay on top of the search results still apply today. Freshness of content (Google emphasis on the importance of recentness of content especially in areas where user is expected to know what the most current information). Sabahan.com organic traffic died out slowly as I stopped publishing new posts. Fast loading site to ensure good user experience. Good quality backlinks matters (this requires a blog post on its own). Bounce rate (the statistic that shows how many people leave your blog without visiting any other pages. You can get this info by installing Google Analytics). Mobile friendliness (Sabahan.com new design is highly responsive and mobile friendly). Setup your site on Google Webmaster Tools. One of the easiest things you can do is adding your blog to Google Search Console. This service allows you to see how your blog looks like from Google’s point of view. You can find out how it appears in the search result, what’s your positions are, how many people click you link and whether Google crawler encounter any problem accessing your site. With this info, you can optimise your site’s performance in search results. 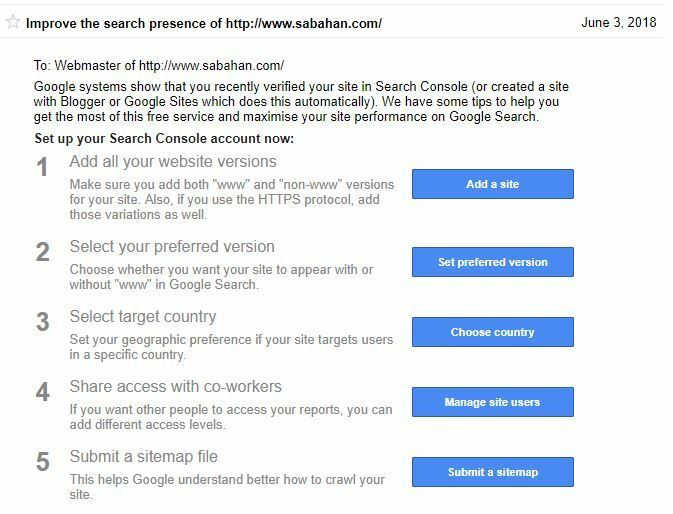 I’ve actually added Sabahan.com before into the console but it appears that Google have stopped indexing it, likely due to the lack of new content. Now, instead of focusing on all the nifty-gritty details of SEO, concentrate on creating useful and original content that solves people’s problems. When people search for a solution to their problem and found your blog, then it is likely that you are going to get shared on social media and ranked in Google. SEO is important but good rankings will come naturally by providing useful and quality content. There’s no need to check all the SEO boxes in one go. Do one at a time while you continue writing useful content for your blog. Remember in the early days (like before 2010), the trend was to ask your visitors to subscribe to your feed. 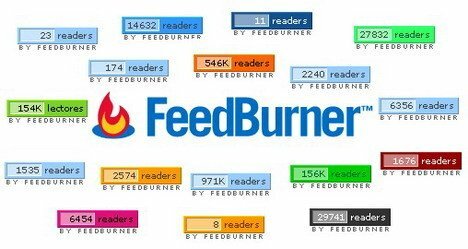 Some bloggers proudly displayed their FeedBurner readers count on their sidebars. Moving forward, bloggers started to display the opt-in form asking for readers’ email address so that they could get the latest updates. As time went by, bloggers realised that they can convert more readers into subscribers by offering something valuable for free. Email is still one of main medium of communication online. So it does not matter if you stop blogging, you can still communicate with your subscribers via email. So for a blog to last for the long term, starting a mailing list is a must. So for that purpose, in a couple of days you’ll see I will start offering a valuable free resource (also known as lead magnet) that my visitors get when they subscribe to my newsletter. Email provides a direct line to my readers. I can use it to build traffic to new blog posts and offer content that may be different from what one can find in the blog. Most importantly, with an email list, bloggers like me no longer have to depend on Google or the social networking sites for traffic. What I find interesting is that, this technique is not yet fully embraced by many Malaysian bloggers (correct me if I am wrong). From what I read, Malaysian tend to engage more on WhatsApp, a trend unique to Malaysian (especially when it comes to selling online). Regardless, let’s just wait and see how my mailing list building effort take shape as I’ll share my findings in my blog. There had been many occasions where my readers and friends asked about my own money making methods. This is something that people really interested to learn. So why not fulfill the demand by sharing my methods in an ebook of in other forms? I’ve personally developed my own software products, mobile apps, ebooks in other niches but why not in Internet marketing? I had this light-bulb moment a couple of days ago. Duh! what took me so long lol. Anyway, one of the reasons for not creating my own products for Sabahan.com was because I spent most of my time working in other niches. I didn’t want to create a half-baked products just to make money from it. I want it to be genuinely helpful for people. And that is not something easy to do. Obviously, it has potential for me to make more money since I am not splitting the revenue with an ad network or affiliate company whose product I am promoting. More money means more motivation to keep Sabahan.com running by providing more great and unique content. That’s a win-win situation. At the same time, I don’t want Sabahan.com to be a place where I just slap several ads and hope things will work out in the money making department. Tried that and it didn’t work (I did make some money but nothing to shout about). Besides having ads in the blog is actually bad for user’s experience. That said, I still plan to experiment with AdSense Auto ads which was introduced in 20th February 2018. Auto ads analyse your pages and find new places to show ads that optimize for revenue and user experience. AdSence will decide where, how many and which ad sizes to place automatically. So I hope to discover whether this feature is a benefit for publishers. Perhaps it is something you can try on your own blog and see if it will provide a better fit to your money making style. May be you have tried already and I am just late to the party lol. It’s 2018, gone are the days where one could start a blog and start attracting organic traffic from Google immediately. The competition is getting fierce and trying to stand out from the crowd is no small feat. I actually have used Google Adwords to advertise Sabahan.com so I will continue to do so as necessary. Another thing that we have today that did not exist before 2010 (well at least not as prolific) is adverting on social networks like Facebook. So I plan to set aside some money to advertise on Facebook and try to learn what my potential audience likes, what gets shared, where they are located etc. I hope this data can help me decide what to write next. As usual, I will share the findings in my future blog posts. So make sure you like our Facebook page and subscribe to our newsletter to get updates! You may find spelling and grammatically errors in this post. I hope it didn’t deter you from reading further :). My goal is not to write the perfect post (I know my English is also not the best in the world lol) but I just wanted to share useful content and get it out there more often. Phew..! With close to 2300 words, this is one of the longest posts I’ve written in Sabahan.com! It took me around six hours to write it. I hope you find it useful. Please leave a comment and share it on your social media page. That will definitely keep me motivated to write more posts like this one. good to know that your writing turbines are afiring again. Yea, lets keep the turbines running! Thanks your reading!